Join us for wine tastings from 1:30-5:00 pm daily. Offering a wonderful array of wines of Plum Creek Cellars, Carlson Vineyards, Two Rivers Winery and other select Colorado wineries, as well as fine cigars. We’re conveniently located – just 25 steps from the 16th St. Mall. We’re downtown Denver’s favorite destination for Colorado wines for both visitors and locals. In Writer’s Square, across from Larimer Square. Address: 1512 Larimer Street Unit R-14, Denver, CO 80202. Buy wine by the bottle or case daily: Mon-Fri 10am-7pm, Sat 11am-6pm, Sun 12pm-5pm.Located just between the 16th St. Mall and Larimer Square in the heart of Writer’s Square. Offering the wines of Plum Creek Cellars and others, plus fine cigars. Tasting daily from 1:30 to 5 pm. Located just between the 16th St. Mall and Larimer Square in the heart of Writer's Square. Store hours: 10-7, Mon-Fri; 11-6, Sat; Noon-5, Sun. 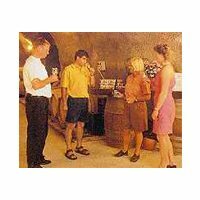 Wine tastings 1:30-5 pm daily.